InstaKey Security Systems provides a progressive alternative to traditional key control methods (or more commonly, lack thereof) that results in significant savings in overall expense and can have a massive impact on a company’s bottom line. 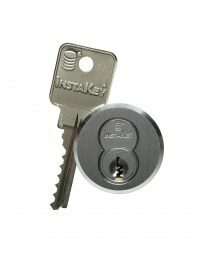 InstaKey’s unique KeyControl® Program is specifically designed to improve each location’s security while saving time and money. Being a “first line of defense” security solution, this program improves each key holder’s accountability, eliminates the need to rekey when keys are returned, reduces operating expenses associated with locksmith services when a key is lost or stolen, and maximizes an overall key management program control. Restricted, Serialized Keys – Assurance of control over key distribution with proprietary, restricted keyways marked and tracked with distinct, individualized serial numbers. Simple and Cost-Effective Rekey Avenue – Meaningful reductions in cost and time required for lock changes with simple, on demand, “single key turn,” rekeyable lock technology. Easily Accessible “Real-Time” Information – Command over all aspects of the KeyControl® Program through tracking of serialized keys to key holders and locations in the only patented, cloud-based key tracking platform. Administered Program Partnership – Support with education and training of program procedures, solutions, and best practices with dedicated KeyControl® Program Management. This is an organized, formally documented and administered program that manages the authorized distribution of keys while limiting the unauthorized acquisition of keys. Most key systems are provided to initially secure the location and control the distribution of keys, but little attention is given to how to manage it afterward. Without consistent management routines, the security investment can easily degrade due to lost or unaccounted for keys, especially when keys can be duplicated without authorization. The ability to implement a Master key system is also available. This would allow authorized personnel to have access to all locks, and the ability to rekey at the Master level without it affecting associate level keys, and vice versa, in the event of a rekeying occurrence. The program is designed to maximize security and minimize costs through re-imagined hardware solutions, cloud-based management (information records owned by you) and a dedicated support team to help keep the program compliant. Data management best practices provide complete oversight to know who has access and what they have access to, making it simple to regain control – regardless of the size or complexity of the particular environment.